Auuuch! I’m hung over and I pulled a muscle in my back (the right lower trap, if you know your anatomy). Rebuilding the bloody computer continues, hence my light (but pithy) blog posts. I know, this is rapidly becoming the Doctor Who Blog. What can I say? The show had a great impact on me during my formative years. I ignored it entirely until I spent a summer in my ancestral village in Guyana back in 1979 (or was it 1980?) The village was completely devoid of anything resembling a Western convenience –no indoor plumbing, no telephones, no TV, no pavement, no street lights. I spent all of my time swinging in hammocks, chasing farm animals, and reading anything I could get my hands on. I read pretty much every book in the village, and the local kids would scour their homes looking for more things for me to read. It was that summer that I read the entire Nancy Drew catalogue (I’d read the Hardy Boys books years earlier). And a woman across the street from my uncle had in her possession a large soft cover tome describing the adventures of the Second Doctor, Patrick Troughton. I had heard of the show, but it had always seemed silly to me. But that book explained to me the show’s basic concepts: a traveler in time and space, getting into adventures and assuaging crises using just his intellect; quite an attractive package for a brainy, geeky child with a longing for adventure but no illusions about his physical skills. Further descriptions of British staples, such as Nelson’s square and Picadilly Circus were deliciously provocative and exotic to my young eyes. Since then, I have always held a fascination for all things British. Anyway, therein lies my lifelong relationship with the Doctor Who franchise. 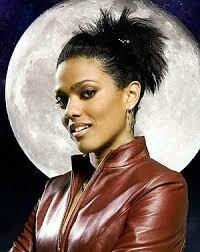 With that background in mind, I report the latest bit of Who news: the unbelievably babe-a-licious Freema Agyeman will not appear in the first half of the next season of Who, and will instead join the loathsome cast of the imbecilic Who spin-off, Torchwood. Well, she can only make that piece of television flotsam better. Okay, remember my ingenious fruit fly killing trap? Well, I still wake up every morning to enjoy its renewed and mounting body count. Then it occurred to me…. Surely, there will be a handful of flies clever enough to escape from my clever trap. Those genetically gifted flies will have been artificially selected by me, and their dumber cousins killed off. The result is that I will have inadvertently bred a new generation of smarter flies! That’s not good. So I watched the trap carefully yesterday. And sure enough, I observed one particularly industrious fly, after hours of exploration, actually escape from the trap! I reveled in its cleverness for about half a second, before acting upon my Darwinian duty and swatting the little bugger. Evolution be damned. Now, my apartment is quite hygienic, so I had assumed the buggers were in fact the dreaded drain flies, and not fruit flies nesting in the carcass of a forgotten hunk of fruit. But I made another discovery: there are more flies about the neighbour’s door. That’s right: it’s my filthy neighbours who are the source of my infestation. Grrrr.